This year marks the 100th anniversary of the Bauhaus. And it’s an anniversary worth celebrating. The German design school is considered the most influential art and design school of the 20th century. Its teachings shaped modernism all over Europe and, eventually, the world. Architect Walter Gropius founded the Bauhaus in Weimar, Germany, in 1919, seeking to unite all forms of fine arts, crafts, and industry. He wanted to level any distinction between “artist” and “craftsman,” believing, instead, that all artists must work as craftsmen, and vice versa. In fact, he wanted to break down many different hierarchies—like those between high and low art, or teacher and student—as a new order of society for the modern age. Walter Gropius designed his house in Lincoln, Massachusetts, in 1938. It was a utopic vision for the future. Gropius’ ideas came at a time when he and others were grappling with the rise of industrialization. And for him, uniting art and functional design would result in good design for mass production, bringing beauty to everyday objects. His school became a laboratory, where students could experiment with different media and methods and forms, all with an eye toward building the future. They studied all forms of media—painting, sculpture, weaving, furniture design, typography, bookbinding, carpentry, and metalwork—although architecture wasn’t added to the curriculum until 1927. The teachings of the Bauhaus school emphasized form and materials. Every element of a design was to serve a purpose. There should be nothing extraneous, nothing unnecessary, no ornamentation. Just the bare essentials. “An object is defined by its nature,” Gropius once stated. The resulting aesthetic was one that was simple, austere, efficient. The style became synonymous with modernity. S.R. 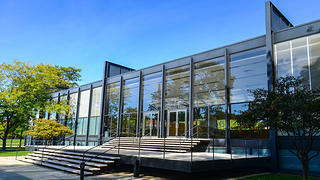 Crown Hall at the Illinois Institute of Technology was designed by Mies van der Rohe and completed in 1956. There was an impressive roster of teachers at the Bauhaus, including some of the biggest names in 20th-century art and architecture: Marcel Breuer, Wassily Kandinsky, Josef Albers, Paul Klee, and Ludwig Mies van der Rohe. But ultimately, the Bauhaus school was short lived, closing after 14 years of operation. In those 14 years, the school relocated twice, saw three different directors at its helm, and faced mounting political pressure from the Nazi party for its left-leaning, socially progressive views, and for its simple, pared-down aesthetic, which was seen as going against Germany’s cultural traditions. The Bauhaus school was forced from Weimar by the extreme right and moved to Dessau, an industrial city, in 1925. Gropius designed a building for the school’s new location (pictured at the top of this story), and the glass, concrete, and steel structure was a manifestation of the Bauhaus’ key principles and had many features that would become hallmarks of modernist architecture—a glass curtain wall, asymmetrical design, and steel-frame construction. Gropius left the school in 1928 and passed the torch to architect Hannes Meyer. Meyer continued in Gropius’ footsteps, emphasizing mass-producible design. But he also focused largely on the social function of architecture and design, championing the good of the public above all else. The Seagram Building in New York City, with its distinctive glass and bronze exterior, was designed by Mies van der Rohe and completed in 1958. Meyer soon found himself under pressure from the government for his political views, and he resigned from his post in 1930. He was replaced by Mies van der Rohe, who placed a greater emphasis on architecture in the school’s curriculum. 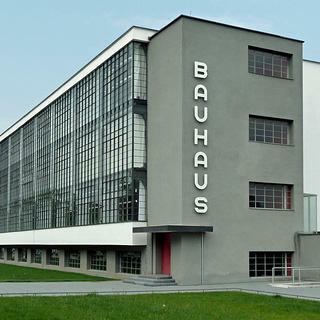 In 1932, National Socialists voted to close the Bauhaus in Dessau. Mies van der Rohe moved the school to Berlin, operating out of a former factory building. But he, too, began facing pressure from the Nazis and closed the school entirely in 1933. Walter Gropius was one of the designers of the MetLife Building (originally called the PanAm Building) in New York City. The 59-story skyscraper was completed in 1963. During the years surrounding World War II, many of the Bauhaus instructors fled Germany, and many of them came to the United States, where they continued to espouse the school’s teachings and philosophies. The school was the subject a major Bauhaus exhibition at the Museum of Modern Art in New York in 1938, Bauhaus 1919-28. Gropius began teaching at the Graduate School of Design at Harvard. He went on to design a home for himself in Lincoln, Massachusetts, and in 1950, his firm, The Architects Collaborative, completed a complex of dorms and study areas at Harvard called The Graduate Center. 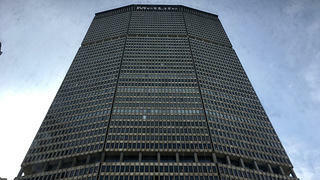 He also designed the PanAm Building, now called the MetLife Building, in New York City, which was completed in 1963, and the John F. Kennedy Federal Building in Boston, which was completed in 1966. 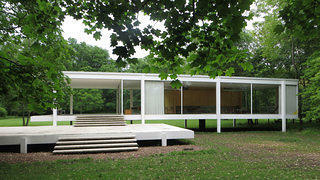 In 1945, Mies van der Rohe designed the Farnsworth House in Plano, Illinois. It is now a National Trust Historic Site. Mies van der Rohe designed the campus of and taught at what is now called the Illinois Institute of Technology. 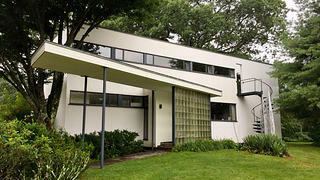 In 1945, he designed the Farnsworth House, an International Style structure in Plano, Illinois, and a National Trust Historic Site. It’s said Philip Johnson took his inspiration from the house when he designed the Glass House in New Canaan, Connecticut, another National Trust Historic Site, in 1949. 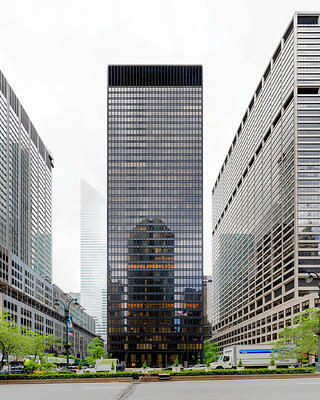 Mies van der Rohe also designed the Seagram Building in New York, completed in 1958, as well as numerous apartment buildings, office buildings, and university buildings. 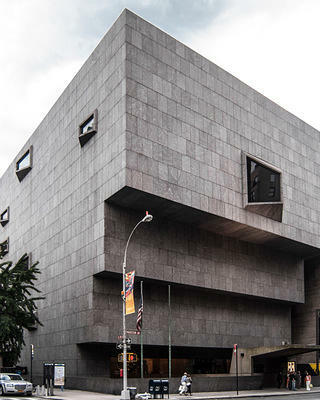 Originally built for the Whitney Museum of American Art in New York, this Marcel Breuer-designed building, completed in 1966, is now part of the Metropolitan Museum of Modern Art and is called the Met Breuer. Marcel Breuer, who was first a student and then later a teacher at the Bauhaus, designed the original building for the Whitney Museum of American Art in New York, completed in 1966. (That building is now part of the Metropolitan Museum of Modern Art and is known as the Met Breuer.) The solid, granite building features asymmetrical windows; a low, concrete canopy and sunken garden at the entrance; glass walls; and handcrafted staircases. He designed a number of houses, school buildings, and libraries, including the Grosse Pointe Public Library in Grosse Pointe, Michigan, in 1953. He also designed the Robert C. Weaver Federal Building, the headquarters of the Department of Housing and Urban Development in Washington, D.C., in 1968. The Bauhaus would eventually influence other architectural movements, including Midcentury Modern and the International Style. 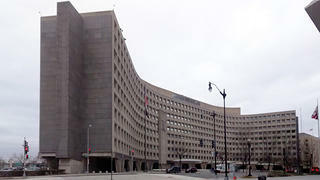 Marcel Breuer designed the headquarters of the United States Department of Housing and Urban Development in Washington, D.C. in 1968. And it has continued to inspire exhibitions, books, and documentaries in the decades since the school closed. In 2016, Harvard Art Museums launched The Bauhaus, an online resource dedicated to the Bauhaus, featuring more than 30,000 documents and images from the school. It’s one of the largest Bauhaus collections in the world. The influence of the Bauhaus school can be seen nearly everywhere—from furniture design (think Breuer’s now-ubiquitous, steel-tube Wassily Chair) to the glass-and-steel office towers rising from city skylines—that it can be easy to forget how its ideas were, 100 years ago, truly radical.